A lot has happened in Goblins & Grottos since my last blog post. In July we went onto Steam Greenlight and were greenlit in just 4 days, with hundreds of positive comments from Steam users. Of course this is hugely encouraging and gave us a nice motivational boost as we started moving past our one-level demo and planning the game proper. We also entered a small competition (Indie Revolution Expo) and won the ‘best design’ award. What I will focus on here though is our cutscene system, which has been becoming more detailed over the past few weeks. We’re putting a lot of work generally in making the map editor as user-friendly and fun to use as we can, and to encourage players to build stories into their maps. Cutscenes will be an important part of this. Cutscenes are triggered when the goblin moves into the invisible trigger identified during map-editing by the clapperboard icon. You identify which ‘actors’ will be part of the cutscene, and these characters have their normal game behaviour over-ridden with the rules specified in the cutscene. 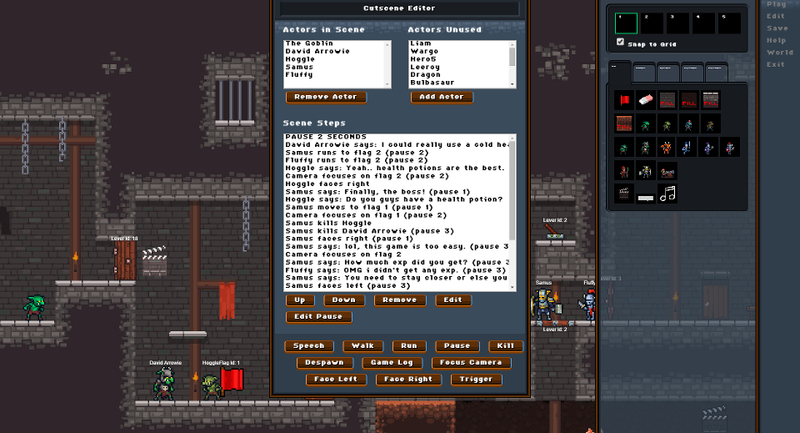 Actors can include enemy heroes, friendly creatures (other goblins, imps, etc.) and also the goblin himself. If the goblin is included as an actor, then the screen zooms in and normal game controls are frozen for the duration of the cutscene. If the goblin is not included as an actor in the cutscene, then the cutscene plays out while you are playing as normal – this allows us to make little stories and interactions occur which you can choose to eavesdrop on or simply ignore. It’s a simple but pretty cool idea and we can already see how it brings the maps to life and gives a feeling that the world around the goblin is alive. So far, our cutscenes let you define where actors move to (identified by invisible flags that you place in the map) and what they say. You can also open/close doors, have heroes kill creatures, and have heroes ‘log out’ (the joke is that they’re playing an online game and – in an act of ultimate insult – they log out straight after killing the goblin’s family, leaving him the quest to track them down and seek revenge). You also define the amount of time that elapses between each step, and centre the camera on different spots on the map – so you can accurately control how the cutscene action plays out.